Requires a 3" Backing Plate. RUPES BigFoot 4” Foam Polishing Pad Mix & Match 4 Pack offers a choice of coarse, medium, fine and ultra-fine foam polishing pads in a fantastic bundle deal. RUPES BigFoot 4” Foam Polishing Pads are comprised of an advance resin cell structure that offers phenomenal results while reducing the polishing compound consumption. 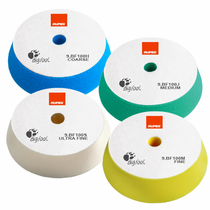 To reduce heat build-up RUPES BigFoot 4” Foam Polishing Pads were designed with a center hole design and when paired with the RUPES BigFoot 3” Backing Plate allows for ventilation through the channels in the face of the backing plate. This innovative design also allows for minimal downward pressure which results in optimum result in less time for a better overall polishing experience. RUPES BigFoot Foam Polishing Pad cone shape design lends to the performance of the throw produced by the RUPES BigFoot LHR 75E Mini Random Orbital Polisher while preventing the backing plate from coming into contact with surfaces. Clean RUPES BigFoot Foam Polishing Pads during use with RUPES Claw Pad Removal & Cleaning Tool to dislodge dried polishing compound. 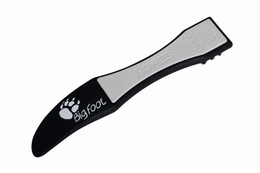 Wash RUPES BigFoot Foam Polishing Pads after use with a mild soap and water mixture by hand or in a washing machine. DO NOT USE Fabric Softener. Air or machine dry RUPES BigFoot Foam Polishing Pads on delicate cycle with no or very low heat. DO NOT USE Dryer Sheets.